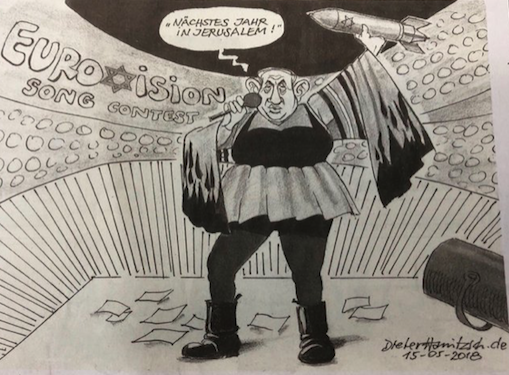 By Jonathan Cook – Nazareth, Israel: My previous post was about the firing of a cartoonist, Dieter Hanitzsch, by the German newspaper Süddeutsche Zeitung after its editor became concerned – though, it seems, far from sure – that a cartoon he had published of Benjamin Netanyahu might be anti-semitic. Here is the image again. It is precisely the promotion of a “kind of anti-semitism”, as opposed to real anti-semitism, that has just forced Ken Livingstone to resign from the Labour party; that empowered Labour’s Blairite bureaucracy to publicly lynch a well-known black anti-racism activist, Marc Wadsworth; that persuaded a dissident comedian and supporter of the Palestinian cause, Frankie Boyle, to use his TV show to prioritise an attack on a supposedly “anti-semitic” Labour party over support for Gaza; that is being used to vilify grassroots movements campaigning against “global elites” and the “1 per cent”; and that may yet finish offLabour leader Jeremy Corbyn, currently the only credible political force for progressive change in the UK. But unlike Wolf, those who do consciously and cynically weaponise anti-semitism gain their power from our inability to stand back and think critically about what they are doing, and why it matters. There is an intellectual and cultural blindspot that has been created and is being readily exploited by those who want to prevent discussions not only about Israel’s actions but about the wider political culture we desperately need to change. It is also why the rationale for Israel is premised on anti-semitism: Israel was created as a sanctuary for all Jews because, according to Zionists, Jews can never be truly safe anywhere outside Israel. Without anti-semitism, Israel would be superfluous. It also why Israel has a reason to inflate the threat of anti-semitism – or, if we are cynical about the lengths states will go to promote their interests, to help generate anti-semitism to justify the existence of a Jewish state and encourage Jews to immigrate. Corbyn has been on the defensive since a “controversy” erupted in March over his expression back in 2012 of support for street art and opposition to censorship amid a row over a London mural that was about to be painted over. Much else is rapidly becoming “anti-semitic”. It is an indication of how quickly this slippage is occuring that repeating now a slogan of the Occupy Movement from only seven years ago – that we are ruled by a “global elite”, or the “1 per cent” – is cited as proof of anti-semitism. The liberal New Statesman recently ran an article dedicated to proving that the articulation of basic socialist principles – including ideas of class war and the 1 per cent – was evidence of anti-semitism.